The British Royal Collection of Fabergé is unique and gives a remarkable insight into the dynastic relationships between the British, Danish and Russian royal families in the late 19th and early 20th centuries. The exhibition Royal Fabergé shows a royal enthusiasm for Fabergé that has lasted more than 100 years. 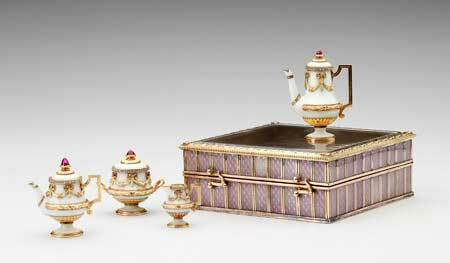 Exhibition highlights include a miniature tea set originally belonging to Queen Alexandra. Comprising of a teapot, coffee pot, sugar bowl and milk jug, it is exquisitely enamelled to give the impression of porcelain. Read full story.